Bootleg Liquor Kills At Least 150 In India's Latest Mass Alcohol Poisoning Indian authorities say at least 150 people have died and 200 others are hospitalized after drinking tainted alcohol. About 100 people died from the same thing in a nearby state earlier this month. A doctor attends to a victim, who had consumed bootleg liquor, at a hospital in Jorhat in northeastern state of Assam, India on Saturday. 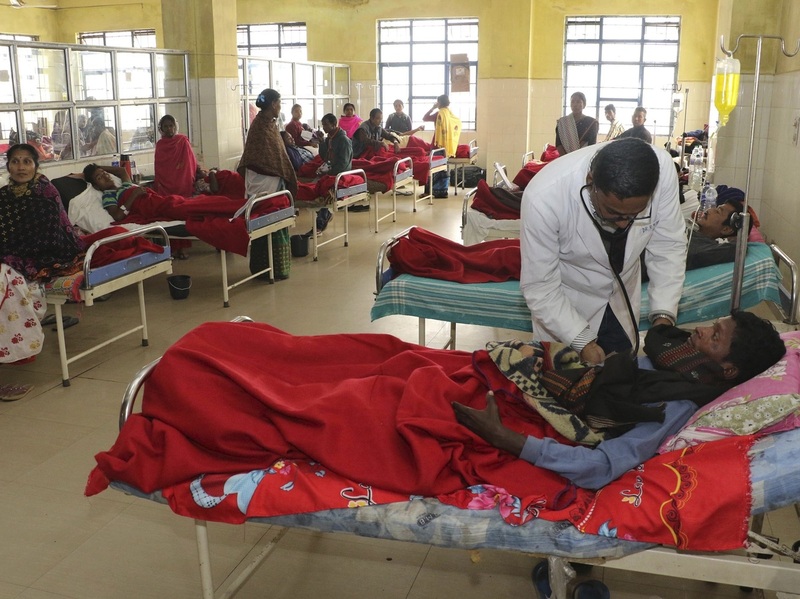 Scores of people have died and at least another 200 have been hospitalized after drinking tainted liquor in two separate incidents in India's remote northeast, authorities said. After long days picking leaves on tea plantations in India's remote northeast, some laborers like to relax with a glass of cheap, strong, locally-brewed liquor. Most can't afford the brand-name stuff. But Indian authorities reportedly say at least 150 people have died and some 200 others are hospitalized after drinking tainted alcohol there in recent days. Some are in critical condition. This is the second mass outbreak of alcohol poisoning in India within two weeks. As many as 100 people died from the same thing in Uttar Pradesh and neighboring states earlier this month. In that incident, survivors said the liquor was unusually milky in color, and smelled like diesel fuel. What they all drank is illegally made, but widespread in India. It's called hooch, or country liquor – a type of bootleg booze you can buy in most villages: at a counter, by the glass, or in little plastic single-serving pouches. It's much cheaper than branded, regulated alcohol. Sometimes it's a brewed or fermented concoction similar to beer or wine; other times it's distilled into spirits. Police said Saturday that they've traced the latest deaths, in Assam state's Golaghat and Jorhat districts, to batches of local hooch laced with methyl alcohol, sometimes also called methanol or wood alcohol. It can be used as a fuel or industrial solvent, and it's widely available in Indian markets. But if consumed, it attacks the central nervous system, and is often deadly. Illicit liquor is often spiked with other chemicals to increase its potency. Many customers can only afford to buy small amounts. Plantation workers started falling ill and fainting on Thursday. Since then they've been rushed to local hospitals by the dozens. Symptoms include intense stomach pain, sudden blindness, vomiting, and heart failure. "I had bought half a liter of wine and drank it before eating. Initially, everything was normal, but after some time my head started hurting," one hospitalized tea plantation worker told the BBC. "The headache grew so much that I could not eat or sleep." An Indian newspaper ran a photo of a victim writhing in a hospital bed, being held down by several people while nurses administer treatment. A second photo shows a body wrapped in a blue tarp, laid out on the lawn of a house, while mourners sit around. Local media say up to 12 people have been arrested, and others are being questioned. The state of Assam has opened an investigation. Investigators are scrambling to trace batches of the liquor that may have been sold at several different roadside stands or markets. Assam is famous for tea. It's the largest tea-growing state, with thousands of plantations that produce more than half of all the tea that comes from India. Millions of people work in the tea industry there. Deaths from illegally brewed or distilled liquor are common in India, but this month's outbreaks are the deadliest in several years.